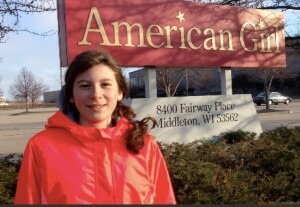 It’s January 1st, and I’m in front of the American Girl factory in Middleton, Wisconsin. They have just announced the new Girl of the Year, Grace Thomas. 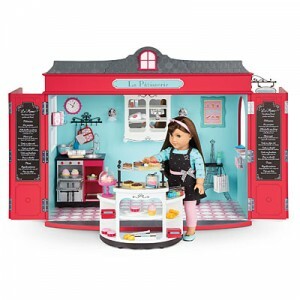 She is a talented baker, and she goes to Paris to help her aunt, who is having a baby. 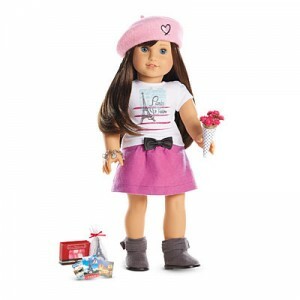 She is a pretty, freckle-faced doll with straight brown hair and blue eyes. She is about $120 – $158, depending on if you get her accessories and if you get her ears pierced. Her big item is a French bakery (literally), and you don’t want to know the price. Do you? I’ll just tell you – it’s $500, plus tax and shipping. I’m going to get it as soon as I make enough money selling jewelry! But… that’s another topic; let’s get back to the reason mom and dad drove me up to Wisconsin! That’s a lot, right? If you have any questions or comments, please leave them below. Thank you! Your blog is awesome! I totally love your Grace Thomas video!